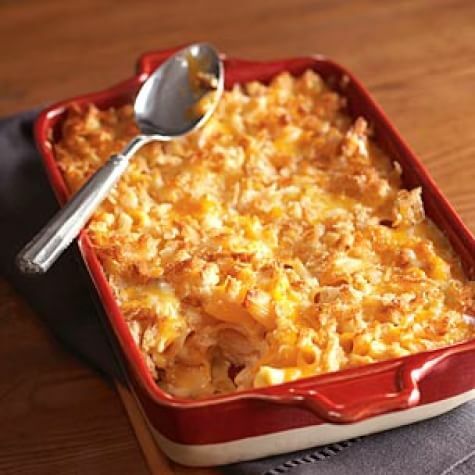 To create this comforting classic, we combine two kinds of cheeses: Sharp cheddar adds a tangy taste, while smoked Gouda lends a delightfully smoky flavor and creamy texture. Preheat an oven to 375°F. Butter a large rectangular baking dish. In a saucepan over medium heat, melt the 4 Tbs. butter. Add the flour and cook, stirring frequently, about 3 minutes. Whisk in the milk and cook, stirring frequently, until thickened, about 5 minutes. Whisk in the tomato paste. Add 1 1/2 cups of each cheese and stir until melted. Season with salt, black pepper and cayenne. Tear the bread into crumbs. In a small bowl, stir together the bread crumbs and the 2 Tbs. melted butter and season with salt. 0 Response to "Smoked Macaroni & Cheese"